According to fresh statistics from analytics firm App Annie published on Wednesday, social media giant Facebook is responsible for four of the top ten most downloaded iOS apps of all time, with Google and Apple titles in tow. App Annie broke down the results of its study, which ranks iOS apps by worldwide downloads and revenue, into two sections: games and everything else. 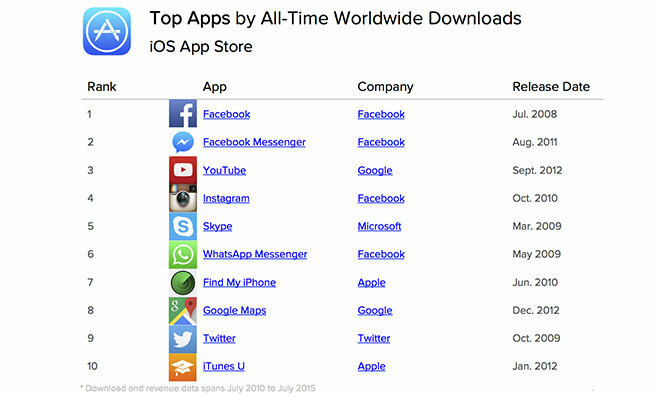 Collectively, Facebook, Google and Apple dominated the most downloaded apps list, taking eight of the top ten spots. Twitter and Skype were the lone standouts. Facebook's flagship app took the No. 1 slot, followed by Facebook Messenger, YouTube, Instagram and Skype. Apple's Find My iPhone and, interestingly, iTunes U came in 7th and 10th, respectively. App Annie said China was in part to thank for the strong iTunes U performance, as the country's download tally came in a close second to the U.S.
All time apps ranked by revenue tells a different story, with Pandora taking the top spot followed by messaging app Line, dating service Zoosk, Apple's Pages word processor and Spotify. Apple's Pages was the only app in the top ten to generate all its revenue from paid downloads, as opposed to in-app purchases and subscriptions. 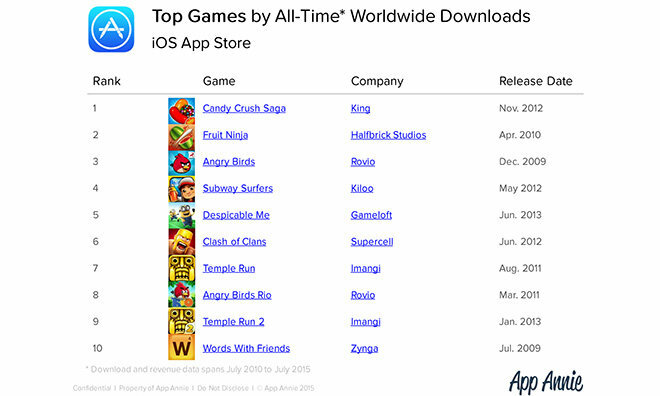 Classic titles pulled in the most downloads in the gaming category, with Candy Crush Saga placing first followed by Fruit Ninja and Angry Birds. Casual games account for nine of the ten top-ranking apps, while seven rely on the swiping gesture control scheme pioneered by Apple's iPhone. As for gaming revenue, Clash of Clans and Candy Crush place first and second, with Puzzle & Dragons coming in third. Looking at app usage, App Annie discovered that many of the most-downloaded and top-grossing titles of all time have the most monthly active users, a trend reflected in both games and non-game categories. The results serve as a testament to the stickiness and staying power of these elite apps as enabled through Apple's iOS platform. 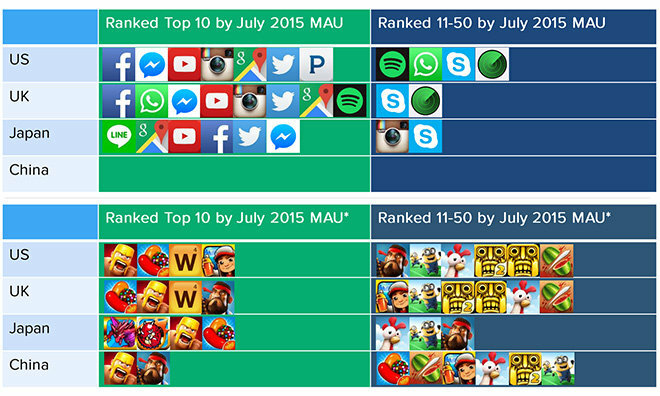 For its study, App Annie ranked apps based on data collated from July 2010 through July 2015.